^ R. W. Sinnott, editor. The Complete New General Catalogue and Index Catalogue of Nebulae and Star Clusters by J. L. E. Dreyer. Sky Publishing Corporation and Cambridge University Press. 1988. ISBN 0-933346-51-4. 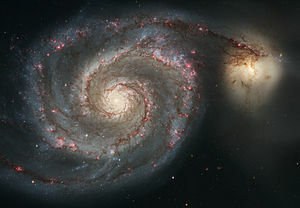 ^ 2.0 2.1 2.2 2.3 2.4 2.5 2.6 2.7 2.8 2.9 NASA/IPAC Extragalactic Database. Results for extended name search on NGC 5195. [2006-12-07]. ^ J. L. Tonry, A. Dressler, J. P. Blakeslee, E. A. Ajhar, A. B. Fletcher, G. A. Luppino, M. R. Metzger, C. B. Moore. The SBF Survey of Galaxy Distances. IV. SBF Magnitudes, Colors, and Distances. Astrophysical Journal. 2001, 546 (2): 681–693. Bibcode:2001ApJ...546..681T. arXiv:astro-ph/0011223. doi:10.1086/318301. ^ 4.0 4.1 4.2 4.3 A. Sandage, J. Bedke. Carnegie Atlas of Galaxies. Washington, D.C.: Carnegie Institution of Washington. 1994. ISBN 0-87279-667-1. ^ SEDS: NGC 5195. [2007-10-13]. （原始内容存档于2007-10-22）. ^ H. Arp. Atlas of Peculiar Galaxies. Astrophysical Journal Supplement. 1966, 14: 1–20. Bibcode:1966ApJS...14....1A. doi:10.1086/190147. ^ A. Toomre, J. Toomre. Galactic Bridges and Tails. Astrophysical Journal. 1972, 178: 623–666. Bibcode:1972ApJ...178..623T. doi:10.1086/151823. ^ C. L. Dobbs, C. Theis, J. E. Pringle and M. R. Bate. Simulations of the grand design galaxy M51: a case study for analysing tidally induced spiral structure. Monthly Notices of the Royal Astronomical Society. 2010, 403: 625–645. doi:10.1111/j.1365-2966.2009.16161.x. ^ M. L. Humason. Supernova in NGC 5195. Publications of the Astronomical Society of the Pacific. 1945, 57: 174–175. Bibcode:1945PASP...57..174H. doi:10.1086/125712.